Red Malay Kratom distinguishing feature is its versatility. Among other Kratom strains, it is one of the most euphoric, which is great for those who could use a mood enhancer. It also has excellent sedative properties, making it a good option for those with anxiety and sleep problems. It grows in deep water and produces stronger leaves. Because of this, supply remains stable even as the demand grows. You can easily find this kratom online. Which Alkaloids Are Present in Red Malay Kratom? 7-hyroxymitragynine and mitragynine, the alkaloids in kratom, provide this strain’s a pain relieving properties. It is particularly effective in managing chronic pain. Red Malay helps in managing stress and anxiety. What’s great is that it will help you reduce anxiety without interfering with your brain’s function such as memory or focus. This strain helps in neutralizing the normal functions of the body. It helps regulate heart rate and brain activity. With this, it can help in improving sleep quality. This is one of the reasons that this is an ideal night time strain. The Red Malay helps provide stress relief. Take it and you’ll notice your muscles relaxing. Aside from making the body more relaxed, the Red Malay helps also has an excellent euphoric effect. The prominent alkaloids in Red Malay Kratom are Mitragynine and 7-hydroxymitragynine. This alkaloid is the most commonly found alkaloid in all Kratom strains. It produces a painkilling effect that makes Kratom more effective. Like the mitragynine, this alkaloid has anti-diarrheal property. It also helps in relieving chronic pains. It’s also an analgesic. Together, these two play a vital role in the effectiveness of Red Malay Kratom. The Red Malay is more effective when taken on an empty stomach. Taking high dosage of Red Malay Kratom is not advisable. There are two common ways to take kratom powder. The Red Malay Kratom can be taken by mouth in the form of kratom powder or capsule. Keep in mind that ingesting a lot may result in a coughing fit. Kratom powder can be added to your food or drinks. Example are adding the powder in protein shakes or mixing it up with your daily tea. This will make the Kratom more pleasant to eat and the flavor won't be noticeable. Red Malay Kratom is originally grown in Southeast Asia. More particularly in Malaysia. Malaysia is a country with a tropical climate. The Red Malay is suitable on this weather to grow properly. Many users of Red Malay Kratom state that the strain can be euphoric yet sedating. This is the reason why they only need this one strain for various needs. Aside from that, users said that they didn't feel funky when they consumed it. Some users claimed that they switched from relying upon anxiety prescription medicines to Kratom. Red Malay strain made them feel that life is now manageable. Others say that it was an easy Kratom to get used to because you can just easily adjust the dosage. This depends on what you want the effect to be. Overall, this Kratom garnered positive reviews from different users all over the world. 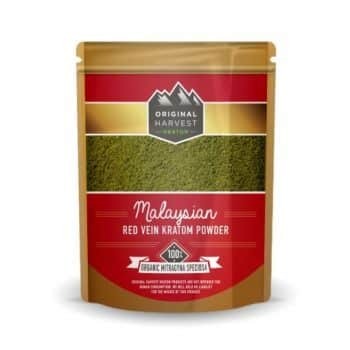 If you want to try Red Malay, get some kratom powder from Original Harvest Kratom. They are offering their own special formulation of Red Malay. Their Malaysian Red Vein Kratom Powder garnered five-star reviews from their users. The product is 100% organic and pure. It has a below average stimulation effect but users claim that the euphoric effect gets them going. In addition, it has its remarkable like pain relieving effect. You get to choose from packaging sizes ranging from 1 ounce to 8 ounces. Red Malay's offers wide-ranging kratom experiences. Aside from pain relieving, it is a great choice for reducing stress, improving one's mood and fighting insomnia. Red Malay Kratom is a good choice for beginners who want to see the range of benefits that kratom provides. It’s also ideal for those who are looking for a strain that has good more sedating and euphoric effects.